Parkland parents attend bill signing ceremony at Capitol in Tallahassee. 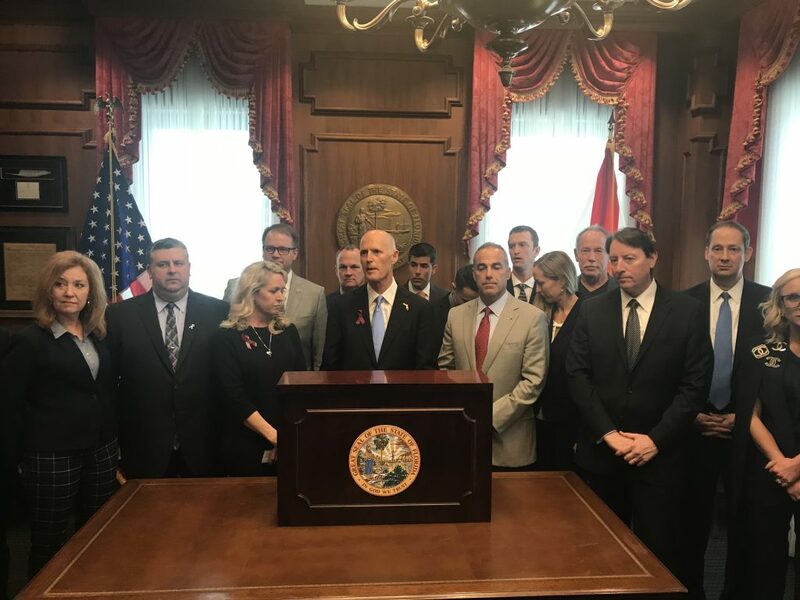 Surrounded by parents of Parkland shooting victims, Gov. Rick Scott signed new gun restrictions Friday in response to the massacre that took 17 lives at Marjory Stoneman Douglas High School. 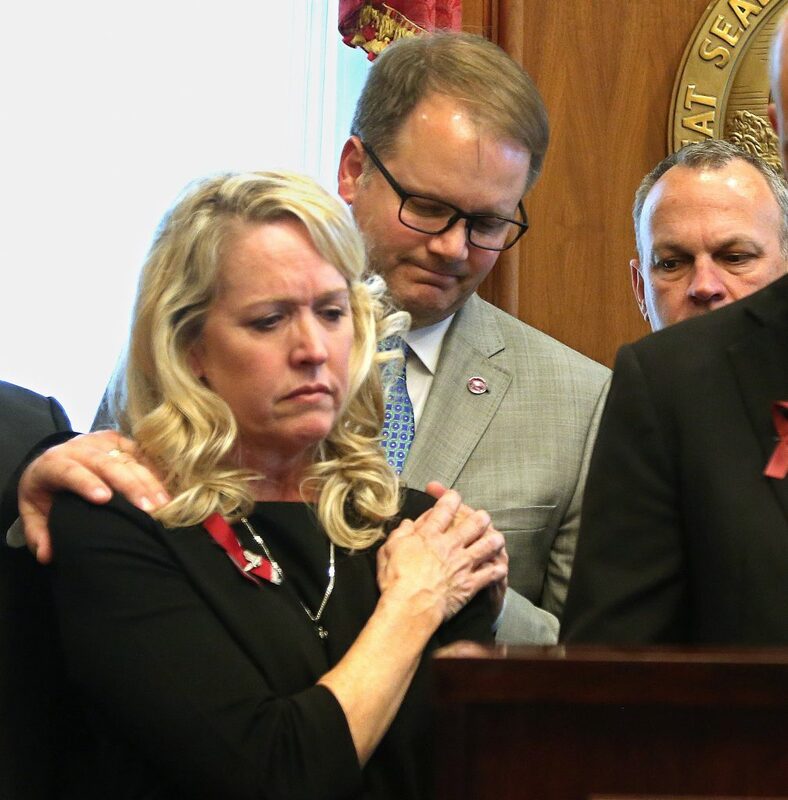 "I called on the Legislature to give me a bill that will allow us to make our schools far safer, allowing for a much greater law enforcement presence and for hardening our school buildings," Scott said. "This bill does that." Scott, a Republican who has long enjoyed the strong support of the National Rifle Association, approved a three-day waiting period for the purchase of all firearms and raising the age to buy a gun from 18 to 21 — changes the NRA sees as violating the rights of law-abiding gun owners. Scott's action and the NRA's response are signs that the restrictions will be a political issue in the upcoming elections in Florida. "This bill punishes law-abiding gun owners for the criminal acts of a deranged individual," said Chris Cox of the NRA's Institute for Legislative Action. "The gun control provisions in this law wrongly blame millions of Floridians who safely and responsibly exercise their right to self-defense." After Scott signed the bill into law, the NRA filed a lawsuit in U.S. District Court in Tallahassee, challenging the age restriction as a violation of the Second Amendment. The bill (SB 7026) became law 23 days after accused assailant Nikolas Cruz opened fire on students with an AR-15-style assault rifle as classes ended on Valentine's Day in a quiet suburb of Fort Lauderdale. The bill bans the sale of bump stocks in Florida and gives police greater authority to ask judges to confiscate weapons from people who threaten themselves or others. "We have paid a terrible price for this progress," said Tony Montalto, a Parkland parent whose daughter Gina was one of the murder victims. Many Democrats and supporters of gun control say the changes don't go far enough. A recent statewide poll said 62 percent of voters in Florida support a ban on assault weapons. But Scott and a majority of Republicans in the Legislature oppose a ban. PREVIOUS COVERAGE: Rick Scott is set to sign the Legislature's gun bill. Here's what's in it. Gun and school safety bill passes divided Florida House, now heads to Rick Scott. Florida Senate votes 20-18 to approve gun restrictions and arming school officials. "I've been clear," Scott said. "I think rather than banning specific weapons, we need to ban specific people from having any weapons." Scott said risk protection orders will keep guns out of the hands of people who shouldn't have them. The bill also includes $400 million for expanded mental health, new school safety programs and replacing the high school building where the shootings took place. NRA lobbyist Marion Hammer called lawmakers who voted for the bill "turncoat Republicans" who "caved to bullying and coercion," and she singled out Scott for criticism. "(Scott) put his hand on a bible and took an oath to support, protect and defend the Constitution," Hammer told The News Service of Florida. "So Governor Scott obviously has a hard time keeping his word." The legislation Scott signed Friday barely cleared the Senate on a 20-18 vote and passed the House by a margin of 67-50 as 19 Republicans, most of whom oppose gun restrictions, abandoned their party's leaders. It was the first time that so many GOP lawmakers broke ranks with Speaker Richard Corcoran, in a clear sign of the divisive nature of guns as a political issue. 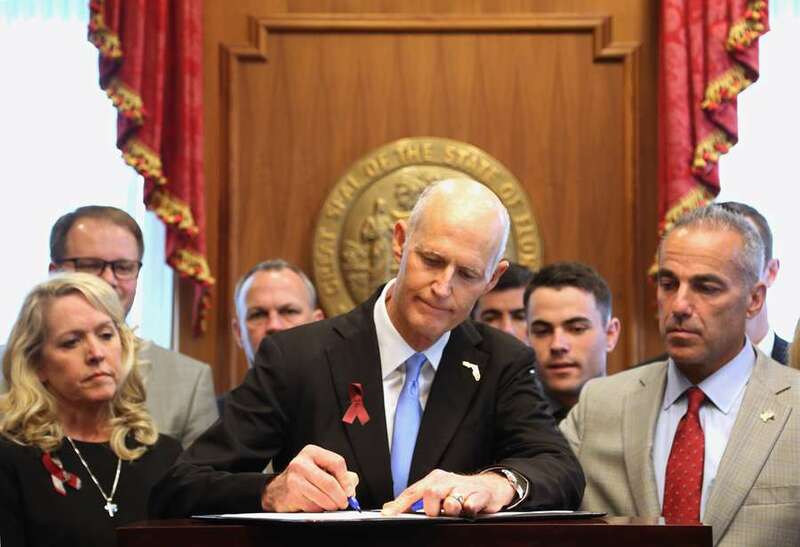 Scott signed his first bill of the 2018 session in his Capitol office surrounded by legislative leaders from both parties, despite his opposition to creating a voluntary program that will allow school personnel to carry concealed weapons on campus. The governor said he will ask the Legislature to redirect money allocated for armed school personnel to hiring more school resource officers instead. The action by the two-term governor comes two weeks before the #MarchForOurLives demonstration in Washington, D.C., on March 24, an event spearheaded by students at the Broward County high school. Scott praised the Legislature for its quick response. Family members of all 17 Parkland victims signed a statement supporting the legislation, and several stood with Scott as he announced his decision shortly after 3 p.m. Friday. Scott, a father of two daughters and a grandfather of six, attended funerals of the victims. The governor singled out two fathers, Pollack and Ryan Petty, who both made repeated trips to Tallahassee to lobby for the legislation. Petty's 14-year-old daughter Alaina was one of the shooting victims. The most controversial part of the legislation is the new Coach Aaron Feis Guardian Program, named in memory of the assistant football coach at the school who died protecting students from gunfire. It creates a new $67 million program for county sheriffs to train school personnel to neutralize an active school shooter. None of Florida's 67 school districts has yet said it will create the program, and several school boards and superintendents say they will not do it. Scott, 65, is in his final year as governor and is a likely candidate for the U.S. Senate. His prospective rival, Democratic Sen. Bill Nelson, said: "This is a first step … We must require universal background checks on the purchase of a gun and get these assault rifles off our streets. Until we've done that, we still have a lot of work to do." The NAACP and the Florida Education Association (FEA), a statewide teachers' union, called on Scott to veto the legislation. The NAACP, the nation's oldest civil rights organization, called it "utterly absurd and misguided" for Florida to allow teachers and other personnel to carry guns in school. FEA President Joanne McCall said the union supports more money to make schools safer and improve mental health services. "The provision that would arm school employees will do more harm than good," McCall wrote. "Our teachers and other school employees are ready to fiercely defend our students, but none of them should ever have to choose between shepherding students to safety or confronting an armed assailant where they are sure to draw fire toward the very students they are trying to protect." A statewide association of Florida school superintendents called on Scott to veto the $67 million for the guardian program. Superintendents say the funding mechanism in the bill is flawed because it allocates too much money for armed school personnel and not enough for school resource officers, who are sworn law enforcement officers. "There will not be enough funding … to actually fund a law enforcement officer in every school," the superintendents said. Scott said if he had vetoed the money, it would not be available to divert to hiring more resource officers. Florida sheriffs asked Scott and legislative leaders to make sure that there's more money to have a resource officer in every Florida school. Some gun control advocates framed Scott's decision in political terms as a rare defeat for the NRA, which has been a powerful force in Tallahassee and other state capitals for decades. "Make no mistake, this was a major defeat for the NRA," the Coalition to Stop Gun Violence said.